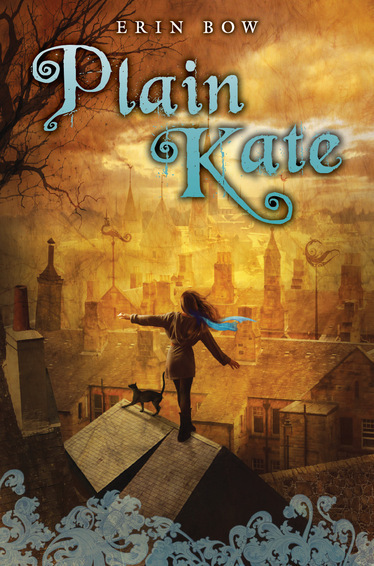 Plain Kate by Erin Bow is a riveting novel that follows a girl named Kate who lives in a world that revolves around superstitions and curses, it is a world where a shadow can destroy towns and a song can unite a community. Kate is an excellent woodcarver because she’s the local woodcarver’s daughter. Kate has earned herself the title “witchblade” which is a very dangerous name in a place where witches are hunted and burned. However when her village is plagued with a strange sickness, and her father dies, she is forced to go and live on the streets with only her cat Taggle. Now a strange fog is engulfing the countryside, ruining crops and bringing more sickness. In this time of distress the people are looking for someone to blame and most eyes turn to Kate. When a strange man named Linay comes to town with a promise that in exchange for Kate’s shadow, he will help her escape from the people that want to burn her. Will Kate take this new chance to start over, with a new home, a family, and a place to belong? Plain Kate by Erin Bow intrigues the reader from the very beginning. The setting was brilliantly written and the author created plot twists that kept me on the edge of my seat. The world in Plain Kate is so realistic and original that you fall in love with the characters right away. Even after I finished the book, I wondered what would have happened if Kate had not taken the chance to escape her town. I would definitely recommend this book to everyone, although it can become confusing at some parts.